We all get to a point where we’re trying to shove way too many tasks into each day. When we’re responsible for blog posts, social media, our inboxes, marketing, and our actual clients, it’s bound to happen. That can quickly lead our businesses to overflow into our personal lives or just being more stressful than they need to be in general. You shouldn’t get to the end of a workday feeling like you ran a marathon. You should still have some brain space to do something fun and spend time with the people (or pets) you care about. In my experience, social media is one of the easiest things to outsource and can also be one of the most beneficial. If you’re active on a couple of platforms, you might find yourself spending 30 minutes or more per day just scheduling posts for social media. Think of how much client work you could get done in that time or how much you could accomplish for the passive income product you’re dreaming up! Of course, you still want to be active when you can instead of turning into a totally automated robot, but there’s no reason for you to be the one scheduling those automated posts. If you’re finding yourself spending too much time scheduling social media posts (and not loving it), make that one of your first few things to outsource. It’s a good starting point because there’s not a ton of training involved and you can find someone who won’t cost an arm and a leg. If you’re in the creative business space, you’re likely doing some blogging or wish you could make the time for it. The thing is, blogging can take a ton of time. You’ve got to come up with a post idea, create an outline, write the content, make sure you didn’t make any grammar or spelling errors, format it, add your post graphics, make it SEO-friendly, and get it scheduled. Not to mention the newsletters and social media posts that should go along with it! It can feel like a lot and something that should be easy (it’s just a blog post, after all) can take a good portion of your day. If you’re feeling this way, blog posts (or parts of them) are a great thing to outsource. If you hate writing the content itself, consider working with a ghost-writer. I did that for a couple months for my posts and newsletters and it helped me get over the feeling of being burned out from all the content I was writing. If that doesn’t feel good to you (or it’s a little more money than you want to spend), keep yourself responsible for drafting the content, but hand it off to someone else after that. Let an assistant take care of things like editing, formatting, and getting things all ready to schedule. You might be surprised at what a huge weight it can lift off your shoulders and how much time you’ll get back for tasks you want to be working on. Now is where our tasks to outsource might get a little more intimidating. Now we’re getting out of the zone of random non-money-making tasks and getting into tasks that deal with clients. It can be scary, but it can also be very worth it. First is client onboarding. I don’t know about you, but I used to spend hours per client when it came to onboarding. I’d make a custom proposal and intro packet to start. Once they signed on I’d jump around to different tools to customize and send a contract, invoice, and welcome packet. And after that I’d jump over to Asana to get us a project set up. Seriously, it took hours. But it doesn’t have to be that way. If you’re intimidated by the thought of outsourcing this type of thing, the good news is that you don’t have to outsource to a person. You can use a tool instead! I’ve used both 17hats and Dubsado. While they’ve both saved me a ton of time, I’m definitely a Dubsado lover for life. I love that there are templates for everything that automatically fill themselves in based on the information you enter about your client. And the best part is that you can set up a workflow once and it’s totally automated for the rest of your projects. I won’t spend much time on this next one, since we’ve talked about it a lot before (check out some posts here), but it’s still worth mentioning. You’re a deisgner because you like…design. Coding is just something that came along with it and is very likely holding you back and making your life more difficult than it needs to be. Working with a developer to bring your website designs to life or just make small tweaks that you don’t have to worry about can save you a ton of time and leave more brain space for the parts of your design projects you actually enjoy doing. Learn more about working with a developer in my free Get Back To Design series! See? We’re still sloooowly getting a little scarier here. But you can do it! 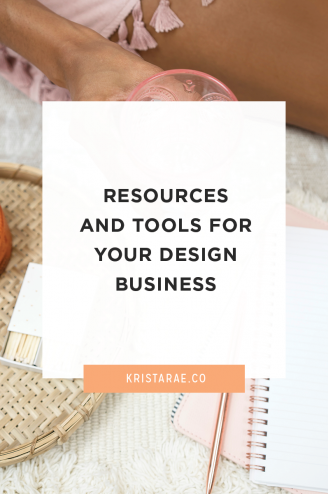 It can be hard to switch gears from working on a big branding or web design project to jumping in to help a past client with a small request. You have to dig up the right files, maybe some login information, and get into a totally different mindset for things like this. But past clients are important for growing businesses, so we don’t have much of a choice. The good news is, you don’t have to take responsibility for all of these small tasks that come up. Find a trusted junior designer or a developer to take care of those small tasks for you. 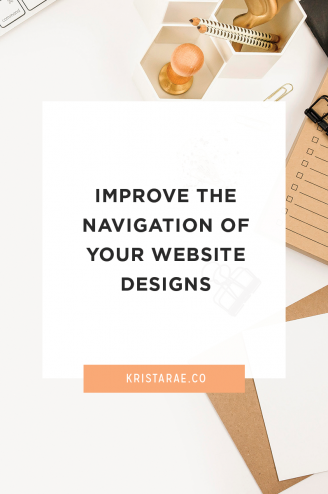 Other people are totally capable of making some small tweaks to a website you made or helping a client do something with a template you made for them. And you can still be the one communicating with your client and collecting payment so they stay loyal to your business rather than someone else’s! Just keep in mind, in this case (and the one we’re about to talk about), these people are considered subcontractors so you want to have a contract in place with them and be aware of laws in your state to make sure they’re not actually considered employees. And last comes outsourcing pieces of your actual design projects. You can do this for a few reasons, but the most common are either that you want to be able to take on more projects or there are parts of the process that you don’t love. So if you’ve been taking care of everything from the initial moodbard to designing the logo to the website design, think about whether there are any pieces of that that you don’t actually enjoy. If you hate making moodboards, let someone else do it for you. If logos just aren’t your jam, bring on a team member to do that part of the job. Just because you’re a designer doesn’t mean you have to do it all. It’s much more beneficial for you and your clients if you concentrate on what you’re really good at. 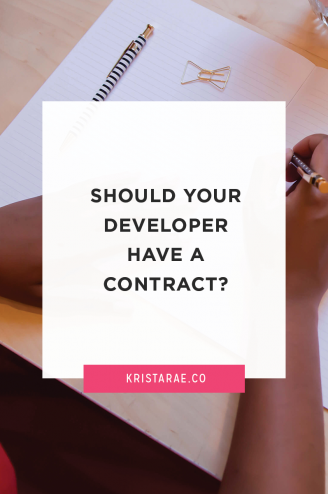 This one is a much bigger step, so if you haven’t done any outsourcing yet, I defintily recommend that you start with one of the first few options we went over and keep this in mind for down the road. Are you ready for more time and brain space? These options will all be right for different people, based on where you are in your business, what kinds of tasks you find yourself disliking, and the budget you have for outsourcing. 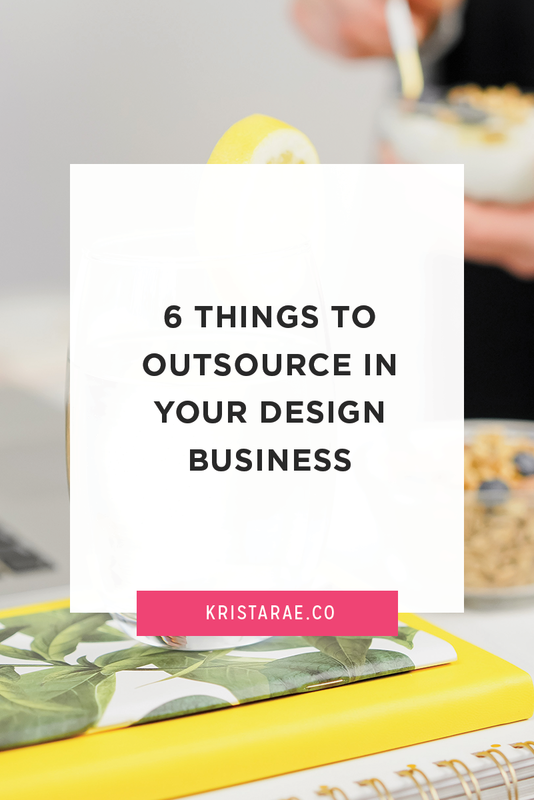 But regardless of what you choose to outsource, you can be sure that you’ll find yourself with more time to either work on other parts of your business or spend time enjoying your life outside of work. If you’ve been thinking of outsourcing your development tasks, whether for a couple hours per month or fully custom sites grab the From Mockup To Code Mini-Tookit! 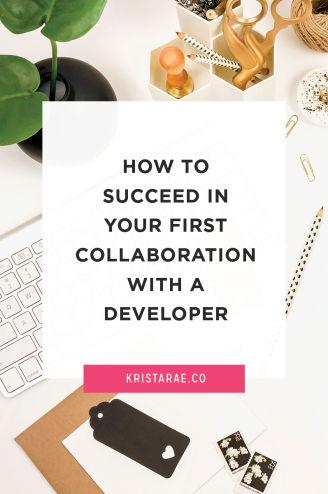 In it, you’ll learn about 9 things you can do to prepare for your first (or next) developer collaboration and receive a detailed checklist of what your developer will need from you.